Kids can talk to their friends long distance with our talk tubes. Remember the old cups and string? Our Talk Tube Kit is it's replacement. It will entertain children of all ages. 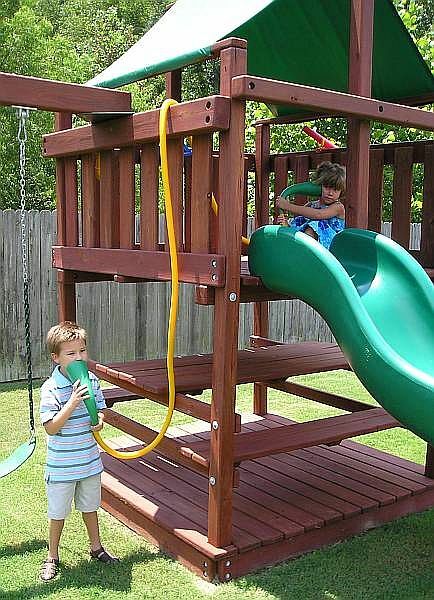 It can be used for not only your swing set or outdoor play area, but can also be used indoors, such as talking from one level to the other on your child's bunk-beds. 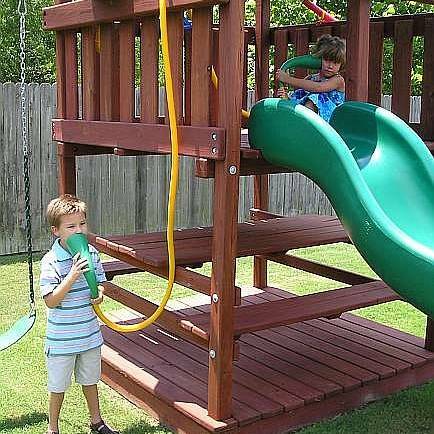 These Talk Tubes will let your child talk as far as their imagination can reach. Such as being in a submarine." Dive, Dive, Dive," is their cry, or being on a ship intercom calling to the engine room, Full Speed Ahead!! Everyone to your Battle stations!! and so much more. These talk horns are amazing, even at 20ft you can hear a whisper. They are made from polyethylene and come in bright colors. They are 19 inches long if straight. Large end is about 4in ID and the small end is 7/8th inch ID. You can glue or zip tie the tubes to the horns.